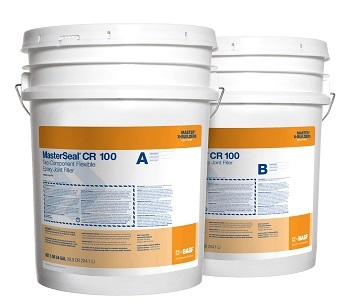 DESCRIPTION: MasterSeal CR 100 control joint filler is a extreme duty grade two-component, self-leveling, non-priming polyurea sealant. Its designed for filling and protecting joints in concrete warehouse floors, parking garages and sidewalks. With 470% elongation, 85-90 Shore A hardness and 1975 PSI tensile strength it protect joints in industrial concrete floors subject to hard wheels and heavy loads. It is also ideal for filling random cracks. No VOC's. Quick Curing. USDA Compliant. Excellent Chemical Reistance. APPLICATION: For professional use only. Respirator required in low ventilation areas. Gloves required. Requires special mixing and application equipment, not supplied. Read MSDS sheets before purchasing or using. See Product Datasheet for details. 1. Install CR-100 at full joint depth to allow for proper load transfer. Do not use sand or backing materials simply to reduce volume. Clean, dry silica sand may be used to seal cracks in the base of the joint if approved by the specifier; however, BASF recommends that the minimum application be 2/3 the depth of the joint or 1”, whichever is greater. 2. Do not install over Backer-rod in sawcut control joints. Fill these joints to full depth with product. 3. Compressible rod may be used at depths greater than 1-1/2" in formed construction joints (expansion joints). 4. Maximum recommended joint width is 1/2 inch, with 10% maximum joint movement. CURE: 1-3 hours until it can be trimmed. Prewarm product to room temp (70 min) when applying at temperatures below 60F. Can be applied down to 40F.